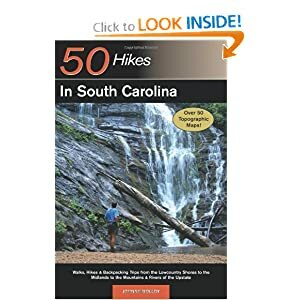 This book details 50 hikes that take place in South Carolina, from Opossum Falls near the Georgia state line to Huntington Beach State Park on the Atlantic Ocean and throughout the state between. Specific emphasis was placed on the most scenic destinations and unique places that make South Carolina so special, places like the Chattooga River, Peachtree Rock and Hunting Island. South Carolina has two long trails, the Foothills Trail and the Palmetto Trail. The Foothills Trail traverses the mountain corner of the state, while the Palmetto Trail is slated to head from the South Appalachians, through the Midlands to the Atlantic Ocean. Many hikes in this book take place on both the Foothills Trail and the Palmetto Trail. South Carolina offers three distinct regions in which to trek, the Upstate, Midlands and Lowcountry. Hikes covering all three areas, of assorted lengths and difficulties are included, and add to the variety of experiences. Hunting Island State Park is South Carolina’s largest island park and is not only a great beach destination, but also offers good hiking trails, a quality campground, cabins and one of the most beautiful lighthouses in the Southeast. The loop hike described offers attractive coastal scenery as it enters a dense forest palms, pines, and live oaks, to then travel along a tidal lagoon just on the backside of the Atlantic Ocean. The estuary is very attractive. Near the end of the lagoon, the trail curves back inland, undulating through ancient wooded dunes on old fire roads in a deep dark forest where furtive deer bound away through thickets. This inland forest is markedly different than nearly every other hiking destination in this book, so enjoy it before you complete your loop. The mosquitoes can be troublesome during summer on this trail, as will heat. The park is busy during summer with beach goers, and if you choose to visit then, bring bug repellent and plan your trek for early in the morning. Late fall through spring is the preferable time to enjoy this hike, however. A side trip to the Hunting Island Lighthouse is a must if you come here. One more thing – parts of the movie “Forrest Gump” were filmed in the vicinity of the trail. From Exit 33 on I-95, take US 21 south for 42 miles, through the town of Beaufort and staying with US 21 to Hunting Island. Pass the left turn to Hunting Island State Park campground and continue on to the left turn into the main park. Keep beyond the side road to the visitor center to reach an intersection. North Beach Road leaves left. Stay forward at this intersection, not on North Beach Road, then stay right, passing beach accesses to reach Parking Area J. The trail starts at the road cut in the middle of Parking Area J leading away from the Atlantic Ocean and the tidal lagoon. There is a park entrance fee. The actual trailhead can be hard to find even when you do reach Parking Area J. Once at the parking area, you can follow the road as it curves around to reach the trailhead, or find the cut in the center of the long wooded parking area and find the trail there. A signboard is located at the trail’s beginning. Immediately enter the dense maritime woodland that makes this hike so special. Tall palms growing in huge numbers intertwine with needle dropping pines and shade bearing oaks, creating a deep dark fairy tale like forest. Look for the trail leading left just beyond the trailhead and take it. Wind through the crowded woods to open onto the tidal lagoon. This narrow waterway separates you from the beach and the pounding surf of the Atlantic Ocean, which is easily audible from this distance. The outline of palms and live oaks on the far side of the lagoon contrasts with the open sky over the ocean. On this side of the lagoon palm trees hang over the water and a small sand beach borders the inlet. Fallen trunks of palms line the water’s edge. Palmetto and yaupon form thickets below the palms. Cacti grow where the sand drains fast. The scene is simply gorgeous. This is a popular fishing area, so don’t be surprised if you see anglers idling away in chairs, pole in hand, vying for saltwater species. They use the trail and a shortcut from parking area J to access the lagoon. Later, the thick forest gives way to a more grassy shore, where palms aplenty rise forth from the sand and grass. The trail here is a sandy track and if rains haven’t come lately, the footing can be loose and travel slows. But who is in a hurry at such a place? Salty breezes drift off the lagoon as you reach a trail junction at .5 mile. Here, a cross trail bisects the greater loop. Keep forward still along the lagoon to reach a second trail junction at 1.0 mile. Here, the cross trail leading right continues across the loop to reach US 21, crosses it, and extends out to a wide open marsh on a boardwalk. If you want to access the boardwalk, continue on the loop and catch it on the other end, because too much attractive lagoon trekking awaits. In places, the lagoon widens. Pines back the palm lined shore. You will likely see shorebirds somewhere along the way. Ahead, the shore stays lined with grass and you travel the margin where palm trees grow from the grass, but not quite where the live oaks and pines form dense woods on the landward side. Reach a trail junction at 1.5 miles. A wide and sturdy bridge leads left over the lagoon. The path beyond it leads to a park cabin area. You are free to use this trail but do not disturb the cabin users. You may choose to go this way and return via the beach, though you must pass beyond the parking area along the beach then find a beach access and walk a road. This must be done to get around the upper end of the lagoon. However, I recommend taking the deep woods route back to the trailhead, then exploring the beach and the lighthouse later. The loop curves away from the ocean then shortly reaches another junction. Forward, the trail leads to the park fishing pier and parking area near the bridge to Fripp Island, while the trail leading right bisects the heart of Hunting Island. Travel on an elevated track amid deeply wooded and surprisingly hilly terrain where the shadows are deep and deer will likely be seen. At 2.0 miles, once again meet the spur trail leading out to the marsh boardwalk. If you take this spur trail it will lead through the dark woods and open onto blindingly open grassy marsh that seemingly extends forever. The main loop keeps in the deep woods of Hunting Island. The smells here – of pine needles, oak leaves and pockets of fresh water, contrast greatly with the aromas of the salty lagoon. All too soon you reach a trail junction. Here, the main path continues forward to briefly hit a park road before continuing on the visitor center, while you take the side trail leading right, which passes through an open grassy area before ending at parking area J at 3.1 miles. Hunting Island Lighthouse stands tall along the preserved coastline of four miles that fronts the Atlantic Ocean here at the 5,000 acre state park, one of the largest in the South Carolina system. The lighthouse was built in 1873. It replaced one that was built in 1859, but dismantled by the Confederates, to confound Union ships offshore as they plied the shoals that mark the halfway point between Savannah, Georgia and Charleston. It was moved to its present location in 1889, due to erosion, and was in use until 1933. The campground fronts the beach on the most northerly part of Hunting Island. That wooded setting of the widespread campground is very pretty and offers RV sites and walk-in tent sites. The campground fills every weekend during summer and occasionally during the week. Sites are usually available the rest of the year.